“As you approach the tree lined driveway you are hit by inviting scents of fresh lavender and rosemary. Le Mas de la Rose sits in the heart of the Alpilles regional natural park, amidst manicured lawns and fields of lavender and olive trees. 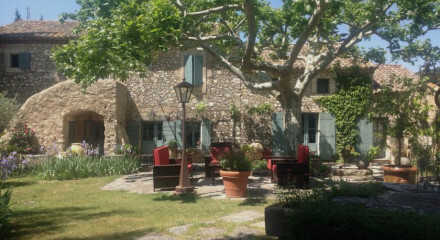 The epitome of Provencal bliss, this idyllic farmhouse is sophisticated and luxurious. Decked in neutral and calming tones with stone floors and fresh linens. Comfort is key here; rooms are spacious with large king sized beds, locally produced toiletries and fluffy bath robes. The staff are friendly and obliging, without being obtrusive. A home away from home, guests can relax with a book in the peaceful lounge area or on the sun-filled terrace with a chilled glass of Rose. 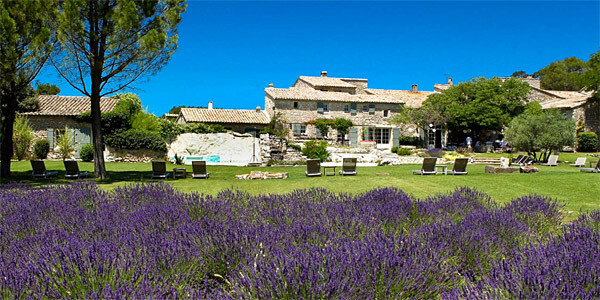 It is hard not to be tempted to take a dip in the expansive swimming pool and spa bath, overlooking fields of lavender. Breakfast included, lunch and dinner by arrangment.